Spring Medicine in a Jar! While I would have loved to have spent the entire day on the couch, I spent the 1st half of the day doing some food prep for the rest of the weekend and the week again and making green juice for the fam, and the plow guy. You know I have a thing about nourishing. 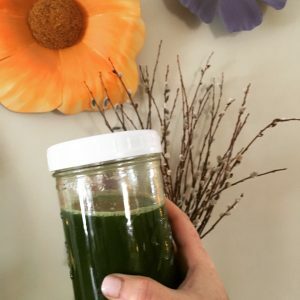 I sometimes make him gluten free goodies, or my #betterthan Mocha Lattes, but he requests my green juice! Who am I to turn the hard working man down? I gotta help him stay fueled up. Full anti-oxidents that fight disease causing free-radicals. Because juicing is a bit time consuming, I make a big batch that lasts for 2-3 days. No worries, I didn’t either until recently and I used my high speed blender. It’s easy as 1-2-3. See below for instructions. PS: Remember my pups…? They LOVE the pulp! I feed them a raw diet so I add all my juice pulp to their food. No waste. Even if you feed your dogs kibble, you can still add this on top for extra fiber, nutrients and #rawgoodness. There are a million different combinations, but this has been my go to lately. Once all your fruit and veggies are prepped... juice away. Leave the limes for last. We will hand squeeze those in last. Don't have a juicer? Thats ok! You can use your high speed blender. In batches, place fruit and veggies into blender and add filtered water about half-way up the container. Blend well. Once blended, pour thru fine mesh strainer with cheese cloth, slowly pressing the juice through using rubber spatula. You can also squeeze the juice through a nut milk bag as well. Repeat until all items (except limes) are juiced. Once you have juiced all your veggies and fruit, pouring into a large bowl as you go, it's time to add the lime juice. Cut limes in half and use a hand held juicer to add the lime juice. Give it a stir and then pour into jars for storage. I like to add ice to mine... so I fill 2/3's full to leave room. Drink within 2-3 days for optimal nutrition and limited oxidation. For even more nourishment you can top with hemp seeds for anti-inflammatory omega threes and protein or my my fave is to make "bubble juice" by adding a scoop of chia seeds. I let them soak for a bit for optimal digestion, extra protein, fiber and omega three action.